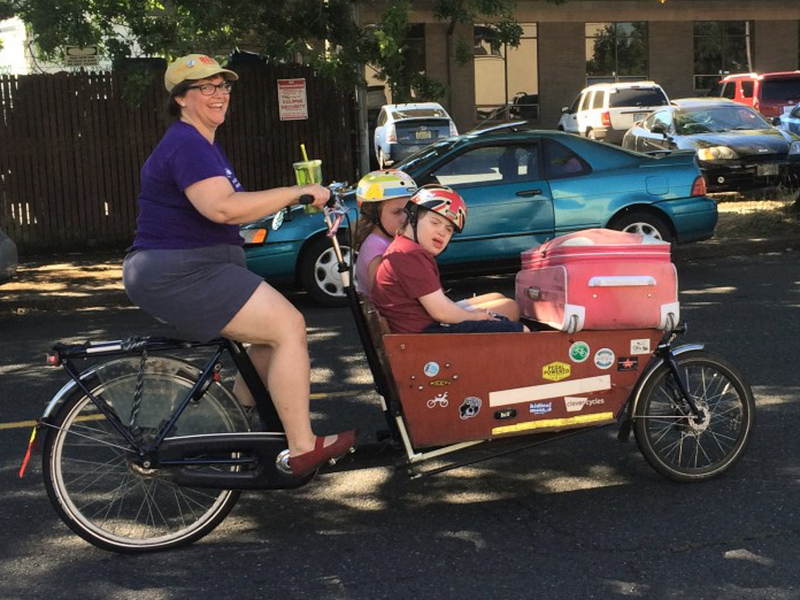 Kathleen Youell, her kids, and my suitcase, in her bakfiets. 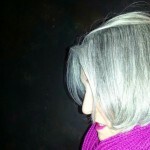 This week on the column we’re going to share a profile of one of our readers. 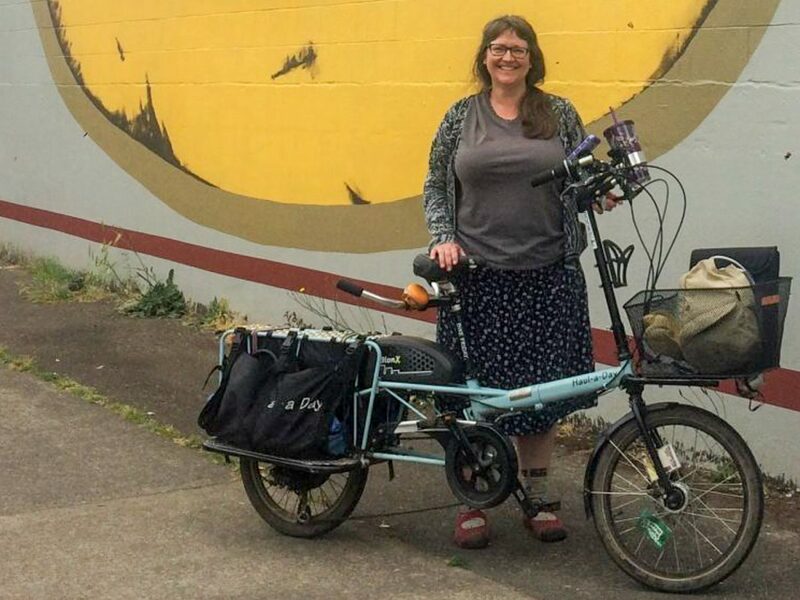 Kathleen Youell has been a fixture in the Portland family biking scene for a long time. I met her seven years ago — three days after I got my first cargo bike — and have been riding with her ever since. 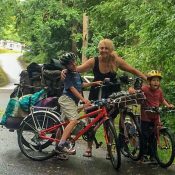 I caught up with her recently to learn more about her family and how cycling fits into it. Myself, my husband Matt Youell, and my kids Evan and Emily are all native Sacramentans. We left Sacramento (California) in 2008 because we didn’t like the hot weather and wanted to strike out on our own. Part of our plan included being carfree, but we had no clue about biking with kids, or the Portland bike culture. We moved to Hillsboro thinking that we’d ditch the car and walk and take transit a lot. We soon found out that a MAX ride to the zoo was an hour and the monthly playgroup for kids with Down syndrome and their siblings was two hours away. We started looking for a place to live in Portland. We found one about the same time we found a used bakfiets [a type of cargo bike] on Craigslist. That was around April 2011. My introduction to family biking was via Twitter where I “met” Sarah Gilbert [@sarahgilbert]. The idea that you could carry your kids on your bike blew my mind. I was so excited to learn more! We came to the first “Fiets of Parenthood” event held at Clever Cycles and gawked at all the bikes owned by people — many of whom are now my friends! I test-rode a bakfiets and bought a helmet that day. Kathleen and her Bike Friday Haul-a-Day “Veronica”. Our first family bike was a Bakfiets.nl. I was the third owner and it was in one of the first containers that Clever Cycles imported from The Netherlands. I loved that bike so much and put stickers all over it because I knew that I would have it forever. I even told strangers that asked about it that I planned to be buried in it. Sadly, the kids grew too big (and my knees too old) for me to cart them around in it. We ended up selling it to a family with a baby which is my only consolation. I’m sure my bakfiets (I never named it) is happier with a baby to carry around. Learning to haul a full cart of groceries without a big box to toss it all in. In October of 2016 I got Veronica, my Bionx’d Haul-a-Day [Bionx is a now defunct maker of electric-assist kits and the Haul-a-Day is made by Bike Friday]. I love her! She still makes me smile when I ride (like the bakfiets did) and that’s the point. I can now go faster than 4 mph and ride farther. I’ve had to learn a lot about loading a bike that I didn’t need to know with that giant box on the front of my bike. Stay away from most of the city’s designated routes! Door zone bike lanes and hills are not your friend. Seriously, can the people at PBOT that designate these routes read a topographical map? Salmon? Harrison? Are you kidding me? There are flat ways around all the hills and your kids will thank you when you take the long, flat way because you will not be out of patience mid-ride. 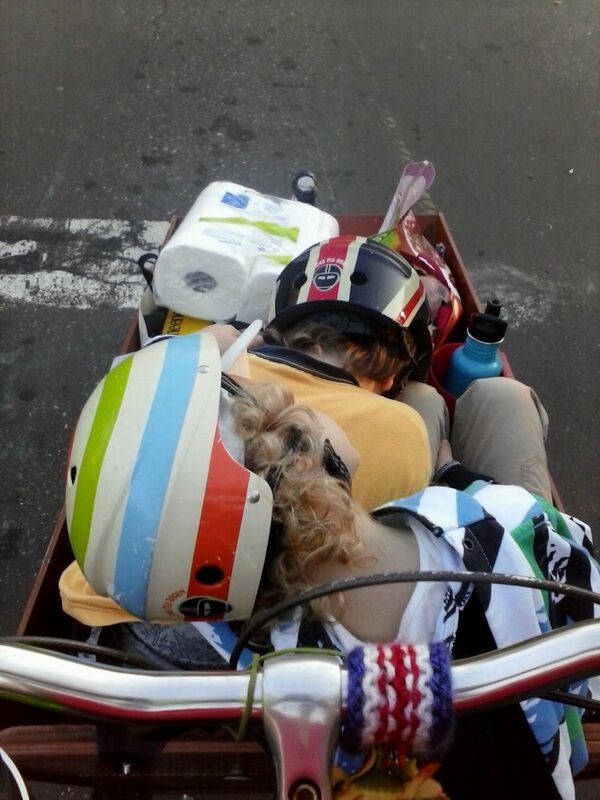 Napping on each other and on the groceries, 2013. School and errands. I ride along side my daughter to school and back everyday. I ride to the grocery store and the library and to knitting and to coffeeshops to meet my friend and write. I take quiet residential streets and cross the big, scary streets at lights, preferably where there’s a green box so that the oncoming traffic knows I’m there. Occasionally I scream at a driver that I have two kids that I’d like to live to get home to, but that’s rare. Usually I notice other people on bikes and on foot are smiling at me and realize I have a huge grin on my face. I’m like that woman in the Portlandia sketch that is just so damn happy to be riding around (sans getting her skirt caught in her chain because I have a chain guard). There have been so many! I led a Kidical Mass to the Fiets of Parenthood in 2013 (in front of the Art Museum) that was so big. I’ve looked all over and can’t find a photo of us arriving at the museum. I do remember seeing Martina Fahrner and Leah Treat standing together as we rolled in, both thrilled at our huge group of families that were riding together. In a tie with that ride for first place is the only time I’ve done the WNBR [World Naked Bike Ride]. It changed me personally for the better to be in a group of people (as bare as I dared with a kidney stone and on my period). I felt safe and more ok with myself than I ever had. It has changed what I’m willing to wear while I ride and what I’m willing to wear in general. Our biggest and stinkiest load: 2 kids and 7 loads of dirty laundry. Contra-flow bike lanes/one-way streets in front of all schools! My kids have only attended three schools in Portland, but all of those have worked hard to keep traffic flowing safety in front of schools at drop-off and pick-up. We get messages from the principals asking parents to drive in one direction around the school so why can’t PBOT get with the program? The long block of SE 34th between Division and Clinton is so much better than it was before; I can just imagine how much better biking and walking to school would be without parents and random cut-through drivers going in the other direction at drop-off and pick-up. Only Seattle since our change to a carfree family in 2009. I biked in Sacramento as a kid and that’s why I’m astounded that people like Elle Steele (@tinyhelmets) can do what my family does here in Portland while living in Sacramento. As for riding in Seattle, I went on a small group ride my first visit and a Mother’s Day Kidical Mass ride the second visit. 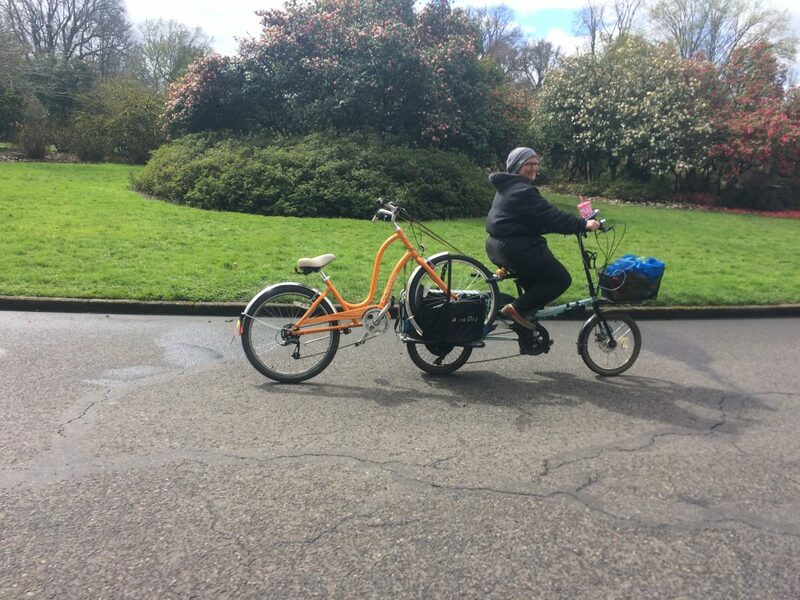 I found the people very friendly and helpful (bikey people are the best people!) and the loaner Bromptons fun to ride. I remember hills (OMG the hills), a protected bike lane in front of my hotel, and a tunnel next to a highway that was beautifully painted and so hidden that I missed it and rode in circles for 5 minutes trying to find the entrance. Classic tourist. 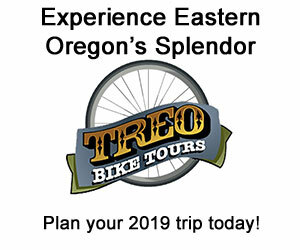 I don’t think I can really compare any of it to my riding in Portland where I can trust my instincts if I want to avoid a hill and leave the designated bike route. Our gridded streets are such a blessing! 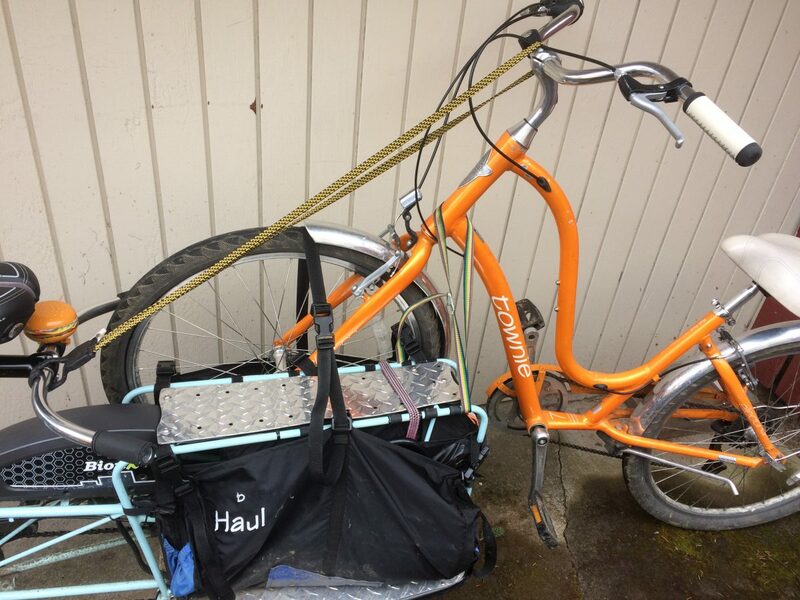 The Haul-a-Day looks small, but it can bag & drag a bike with bigger tires than its own 20″ ones. To the general readership, please respect parents riding next to their children. I’ve had people ride between us, pass us on the right, and other dangerous things. My daughter has ridden her own bike for less than a year after over six years of sitting in front of me while I screamed at bad behavior of drivers. Stop freaking us out and teaching her bad behavior! To family bikers, current or interested but concerned, there are lots of ways to connect with us online and in real life. 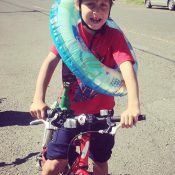 Come to a Kidical Mass ride! 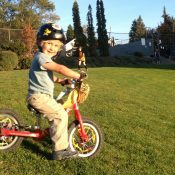 Find a group on Facebook (PDX Cargo Bike Gang, Seattle Family Biking, or San Francisco Family Biking are all good ones) and ask questions. Don’t be afraid to vent your frustrations. Talk about routes and how to handle tantrums (children and/or drivers). There’s nothing more fun that getting to talk about family biking with other people that aren’t concerned that you shouldn’t be biking with children or who want to have The Helmet Discussion. I do! Twitter (@kyouell) and my blog (www.portlandize.com) or the PDX Cargo Bike Gang on Facebook are where you’ll most frequently find me. Thank you for sharing your story Kathleen! And thanks to you all for reading. We’re always looking for people to profile. Get in touch if it sounds like fun to you. And as always, feel free ask questions in the comments below or email me your story ideas and insights at madidotcom [at] gmail [dot] com. The shot of the napping kids is just brilliant. 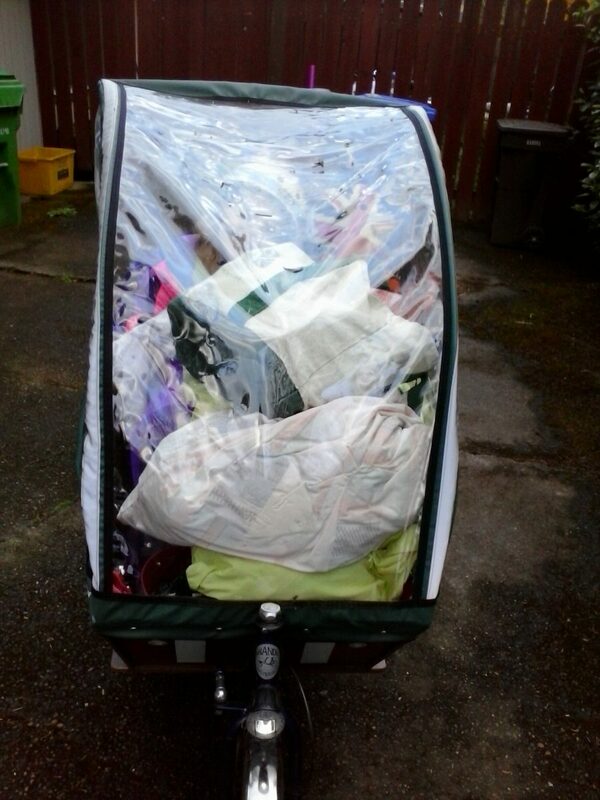 It’s my favorite bakfiets photo. If only our many departments of transportation would listen to this. There are a lot of things to fix on our streets, but the door zone bike lanes should be the first on the list. Oddly, I was down south last week and it showed how enforcement is always going to be key no matter how good a job the traffic engineers do. On streets where the traffic engineers had really put effort into making the bike lanes wide enough that there were four or five feet of bike lane clear of the door zone, their efforts were completely undone by motorists who parked three to five feet from the curb. Good to hear about you, Kat and see all your configurations! I think the last time we crossed paths was at a Portland Fruit Tree Project by bike trailer event a few years ago. And Anne Hawley is back too!!! Yes, I remember! It was hard to get work done and corral the kids. Maybe I can try again now that they’re older. Well, for the most part. Considering getting around a hill can be just a few blocks off (SE Grant instead of SE Harrison/Lincoln from SE 20th or 22nd to SE 32nd Pl) why did they make the route straight up the damn hill? Thank you, Caitlin! You inspire me too! So true! Whoever decreed the north/south bike route would go up Wiberg Lane deserves to ride that route about twice a day for the rest of their PBOT career. A noble thing to live car free. Too bad such a small minority are able to do it. Plus, I wonder how car free she lives during a Portland winter? No mention of that. Agreed. I assume everything they need (work, shopping, school) is all within a small radius of where they live. Not so easy for many people especially out eastside. do you ever do anything that isn’t easy, Lester? Our choice of how to free money in our budget from car maintenance & gas so that we could afford to live closer in was a conscious one. Not everyone makes the same choices, but I don’t think that makes ours a bad one. When we first went car-free we lived on E Main in Hillsboro, so I’m quite aware of what it takes to do this in the ‘burbs. I never said it was easy, but it was easier for us to find the time to walk or bus places than it was to find the money to fix or replace our van. It was a logical financial choice to finally do what we were dreaming of despite Hillsboro being so far from so many things we wanted to do. I readily admit there was an emotional component for me as well. I have cousins that were in the Marine Corps at the time and couldn’t bear the thought that a chaplain would have to visit my aunt due to my continued use of gas. Then there’s the fact that our son’s Down syndrome will probably mean he won’t ever get a license (not true for all that experience life with Down syndrome, just speaking of him) and it’s important to show him that you don’t have to drive yourself around to have a good life. As you can see there are a lot of facets to our choice. “How easy will this be?” isn’t really one of the questions we asked ourselves. I think that there are more people that would live this way if it occurred to them that it was an option. It’s like the guy that said it was impossible to carry a watermelon on a bike; clearly, he doesn’t know all the biking options that are out there and that is what makes more things possible. do you mean “too bad such a small minority are willing to do it”? We donated our crappy full-size van in 2011 when we moved from Hillsboro to SE PDX. It had been parked since spring break of 2009 so there didn’t seem to be any reason to try to fix it. Since we were already car-free in the burbs without bikes, being car-free in town with them has relatively been a lot easier. We are very lucky to live in a part of town that has 2 grocery stores within walking distance even when everything is closed down with icy roads (YakTrax are great!) and 3 more within 10 minutes biking distance when the weather isn’t too bad. 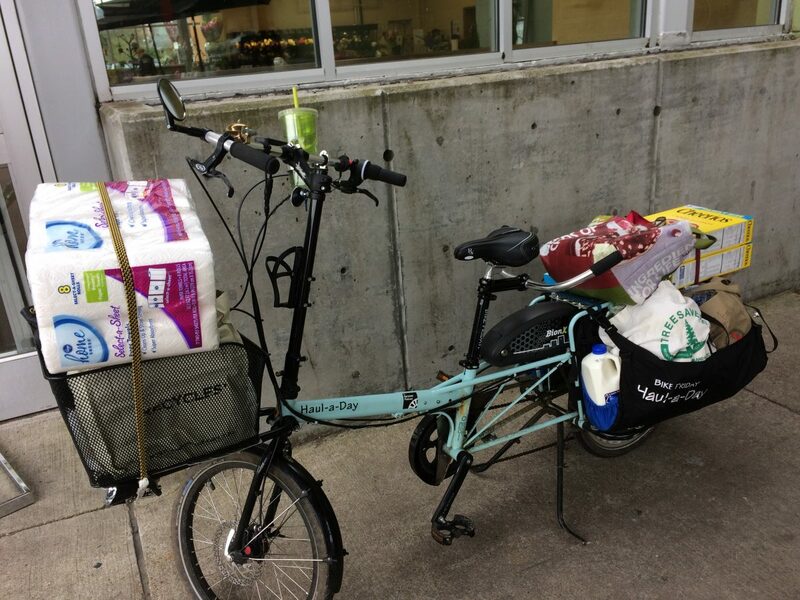 There’s even a WinCo that I bike to when the weather is good enough. We have rented a car 3 times: 2 weekend trips to the Tolovana and 1 two-week trip to Yellowstone. 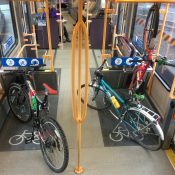 Other than that it’s bike or transit. Oh, wait! When I developed an infection a week before my kidney stone was removed a friend gave me a ride to the ER and another friend gave me a ride home after the stone was removed. I hope that’s not against the rules! In my opinion, being car-free is easier than our society makes it seem. Yes, it takes longer to get places (sometimes) and you get wetter (sometimes), but there are an awful lot of positives. And once walking a mile feels like no big deal, walking two miles becomes more mentally-doable. The mindset is a lot of what has to be overcome. HOWEVER, my existence as someone who can’t afford a car and does without is not in and of itself a condemnation of other peoples’ lifestyles. So why get all snarky about how we’ve chosen to spend our budget? I didn’t say anyone else should do it (though if you want suggestions or want to know what we went through I’m happy to yammer on about it — obviously). That was supposed to be in the thread with Mike Quigley’s snark. My reply didn’t thread, but it’s here. I have many soaking wet photos to attest she lives completely carfree during every season of Portland!! Yay! Kath is the best — always there with a smile, wave, and bell ding. Great profile, thanks for sharing your tips! Oh, and I can certainly confirm that she rides in winter. 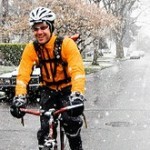 C’mon, now, didn’t your mama teach you that there’s no such thing as bad weather, only bad clothing? Thanks! I’m going to miss seeing you on the school run now that my kids are both out of elementary. Getting to start with the kids under a canopy and only worrying about myself getting wet was such a fortunate way to start. Receiving a CleverHood as a gift made it a lot nicer for me. You’re so right about having the right gear. Thanks for the great interview! I would like to add, though, that Kathleen is also a great representative of the “chill” cyclist and even has a coffee/smoothie cup holder on her handlebars. I’m sad to learn that I won’t be seeing Kathleen everyday on our ride to school. Are you hearing us yet, PBOT? 20s Bikeway. What a waste. We told you, but no. You know better. I remember so clearly when you came riding up to the art museum at that Fiets of Parenthood — I cried. It was for me, too, one of the most memorable moments of my life as a family biker!! I remember when you took the first test ride, too. You’re amazing Kath!! I would be honored if you were buried in it. Will have to show you the new stickers she got! Awww! More confirmation that you were the right person to sell it to! Mwah! Thanks for the laugh, Kath! And thanks for this piece, Madi! I love hearing about how people with families live car-free and car-light.